Activists at the COP16 demand climate justice with symbolic Moon Palace occupation - Climate Justice Now!Climate Justice Now! Cancun, Mexico–At 1:15 PM on the last day of the UN climate talks, a dozen participants staged an un-permitted action at the Moon Palace where the climate negotiations were taking place, to protest the silencing of civil society voices by the UNFCCC. 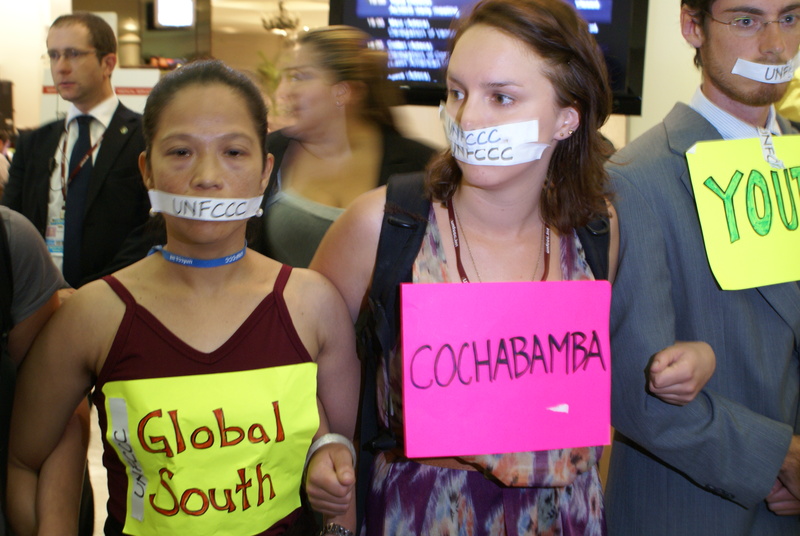 Their mouths gagged with “UNFCCC,” they locked arms in front of the escalators leading to the closed chambers where high-level climate negotiations were taking place. 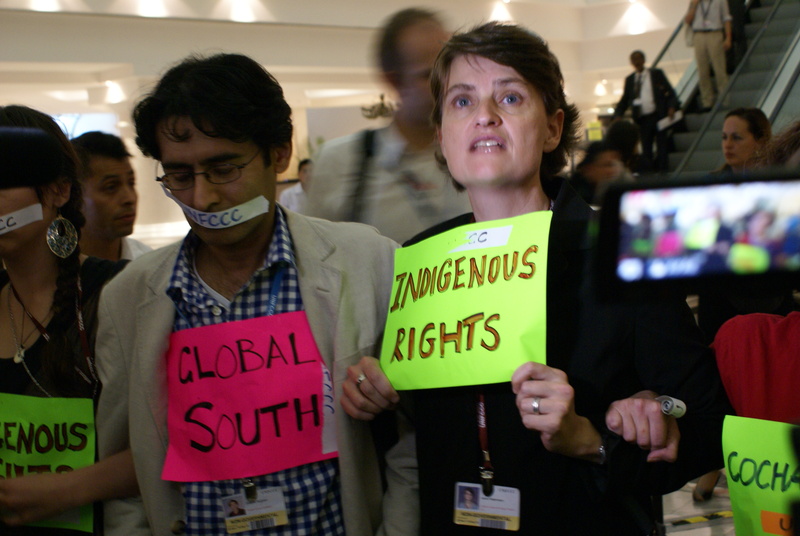 The group stood their ground amid an onrush of security, as Anne Petermann of Global Justice Ecology Project, Deepak Rugani of Biofuelwatch and Global Forest Coalition, and Rebecca Leonard of Focus on the Global South shouted, “The UN is silencing dissent!” and other slogans referring to the shut down of people’s voices at the climate talks. “We took this action because the voices of indigenous peoples, of women, of small island countries, of the global south, must be heard!” they demanded. Participants in the action were finally forced out of the building by security, but refused to unlock their arms despite security manhandling. They were expelled from the UN Conference, their accreditation badges taken away, and put on a bus that took them to the Villa Climatica, miles away from the Moon Palace. Global Justice Ecology Project took action today to protest the silencing of dissent within the UN Climate negotiations. Anyone whose interests do not reflect those of the global elite is being marginalized, ignored and shut out of the talks. At the UN Climate Talks in Copenhagen last year, dissent was criminalized and activists charged with terrorism for organizing the “Reclaim Power” protest. Here we are seeing a continuation of this trend with a zero-tolerance policy for dissenting voices. Global Justice Ecology Project also undertook this action in memory of Lee Kyung Hae, the South Korean Farmer and La Via Campesina member who martyred himself at the in protest against the WTO here seven years ago. In 2003 the fight was against the repressive trade policies of the WTO. Today the struggle is against the repressive position of the UNFCCC, which has become the World Carbon Trade Organization, and is forcing developing countries to accept policies that go against the interests of their citizens and the majority of the world’s inhabitants. REDD – the scheme of Reducing Emissions from Deforestation that is being pushed through here, despite widespread concern about the human rights and ecological catastrophe it may bring, is a prime example of the kind of market-driven, top down policies of the UNFCCC that will allow business as usual to continue beyond all natural limits. These unjust policies will severely impact forest-dependent and indigenous peoples, campesinos, and marginalized peoples across the world. From before the opening of the UN climate talks in Cancun on 29 November 2, through to the final moments, the atmosphere at here has been one of marked by exclusion, marginalization, and silencing of voices. When the UNFCCC’s negotiating text was released on 24 November, all language from the Cochabamba People’s Agreement – a document developed by 35,000 people- had been removed. In its place, was a warmed version of the unjust Copenhagen Accord. Arriving in Cancun, UN climate conference participants found an armed citadel, a civil society space set literally miles away from the negotiations, inflated prices and hours of travel daily. For NGOs and civil society groups, as well as for the smaller and less economically empowered delegations from the less developed countries, such obstacles are crippling. Activists and representatives from civil society have been systematically excluded from the meetings and even expelled from the UNFCCC itself. When voices have been raised in Cancun, badges have been stripped. Tom Goldtooth of the Indigenous Environmental Network lost one precious day of negotiations due to the suspension of his badge for simply speaking in public. Youth delegates were barred for spontaneously taking action against a permitting process for protests made unwieldy and inaccessible. NGO delegates were banned from the Moon Palace simply for filming these protests. The exclusion and silencing of civil society voices here in Cancun mirrors the larger exclusion and silencing here of the majority of people – indigenous peoples, women, youth, small farmers, developing countries– whose position does not reflect that of the global elite. This is why, in solidarity with our allies from oppressed communities in the North and the South, we took action to demand justice in the climate negotiations. This entry was posted in Cancun / Mobilisations by admin. Bookmark the permalink.